Leeds-based Jon hasa a famous virtuoso style, and his live shows combine deeply personal performances with a natural wit. Join multi-instrumentalist jazz-giant Mr Pine, CBE. The fusionist is returning to tenor saxophone for the first time in a decade. Joining him this evening is a man whose 1992 vibe on the single There’s Nothing Like This is a breeze of beauty. Ticket-holders will be looked after by two terrific talents. Ziggy Stardust, Aladdin Sane, Thin White Duke, Major Tom and more...the many personas of David Bowie with one thing in common; Lasting songs that inspired a generation. Plenty of the songs from all eras of Bowie’s celebrated career will air. A terrific night of wowie-Bowie. An electric guitar, acoustic guitar, violin, piano and small amp will be waiting on stage as the Irish singer-songwriter comes to town as part of her continuing Naked...Live tour. Expect an exploration of the best of her catalogue in the simple engaging starkness of her own performance. 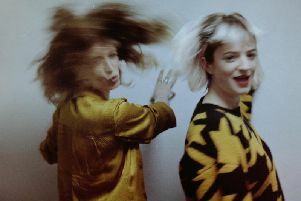 2016 was a pretty swell time for the girls Ward Thomas - the chart-topping twins reached the number one position for their sophomore album Cartwheels, played a run of 16 completely sold-out Uk dates and crowned their live schedule with a spectacular sold-out show at the Brooklyn Bowl. Brit Award and Ivor Novello award-winning KT is back on the road following the release of her critically acclaimed KIN opus. With five albums of solid sounds from which to choose, this show will be taut and terrific. Isn’t KT always like that? Special guest will be Nina Nesbitt. Take nine well-rounded musicians attune to every step of the music composition process, and who safeguard every last detail of their shared vision - from the rehearsal room to the mixing board. Their arrival in Milton Keynes comes as they near the end of a pretty extensive UK tour, so they’ll be even more well-oiled and fluid than usual.